Business Systems & Consultants’ evidence storage and evidence management solutions are designed with public safety in mind. To BSC, it is never about storing “stuff.” Evidence Storage is a mission-critical need of all state, local, and federal law enforcement agencies. Through the chain of custody, items must be tracked, audited, and protected from contamination, tampering, and loss. 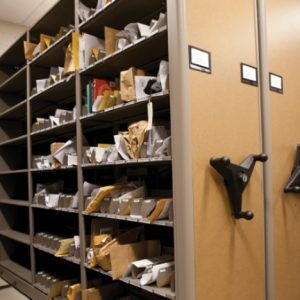 Evidence comes in many forms, and a municipality may need to store millions of items from bio-evidence to auto parts to controlled substances and weapons. 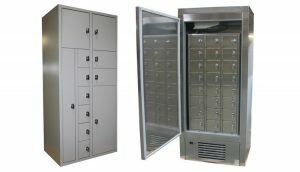 Evidence storage locker design often includes consideration that involves protection from heat, moisture, and cold while allowing for intelligent tracking with barcode systems and advanced RFID technology. Business Systems & Consultants’ evidence storage systems come in many configurations including, but not limited to, mobile shelving, dry storage, warehouse racking, pass-through lockers, and wire mesh partitions. Protecting citizens means equipping agencies with evidence storage management solutions that support law enforcement and ensure the integrity of evidence that is collected. Business Systems & Consultants’ evidence storage solutions, support police, law enforcement public safety and good government. Law enforcement agencies face unique challenges when it comes to personal and public safety, not only because of the types of evidence you have to store, but also because personnel, the public, and people you take into custody must be prevented from accessing this evidence. As such, it’s necessary to choose storage and evidence handling solutions that can be secured and locked. Fortunately, BSC has a great deal of experience with storage that’s designed with safety in mind. These safety measures include wire mesh security cages and partitions to safeguard evidence and people, rack safety systems to enclose warehouse racking and lockers that are equipped with a keyless locking system that’s designed specifically for weapons and other tactical and law enforcement needs. Even though many law enforcement agencies have similar evidence storage needs, they’re all configured differently, and this means there’s no one-size-fits-all solution for material management. However, BSC specializes in finding tailored storage options for agencies just like yours, and this includes coming up with solutions that are customize designed for your space. That includes everything from measuring your space and finding ways to optimize your storage area and configuring shelving and racking according to your needs. For instance, there are woven wire partitions with closing doors that can be hinged in either direction to accommodate your space, storage options that can be built into the wall, mobile shelving that can be moved and condensed as needed, and more. You have enough on your plate being in charge of the personnel and operations of a law enforcement agency without having to worry about logistical problems like evidence lockers and storage. Let BSC take the lead on your next project, and we’ll create customized evidence storage and management solutions that are tailor-made for your needs and your space. We have years of experience helping law enforcement agencies with evidence storage, so for a free assessment, or to discuss other products that are designed specifically for law enforcement needs, contact us today.